1) You need to have an emergency fund. This is the first step for anyone - you need to get into the habit of saving money, no matter how hard it is. Even if you can put away $25 or $50 a month, that's a start. You can easily set up a savings account online or through your local bank. Don't worry about the low interest rates, you just need to build up enough money so you use it if your home or car gets damaged, you have an injury, or your refrigerator calls it quits. Not only will you have some extra money when needed, but you will get used to the idea of saving money. Sure, this might be a bit harder. But after you get a few thousand dollars in your emergency fund, you need to start thinking long term. If your employer offers a retirement plan at work, make use of it. Sometimes they'll even match some of your contribution, so its like getting free money. If you don't have one, set up an IRA at your local bank. Time is your biggest friend when saving money, so the earlier you get started, the more you will save - BUT it is never too late to get started! There are lots of ways to reduce your debt. You've probably heard of most of them - debt consolidation, debt settlement, debt snowball. But the most effective method of all? Stop using your credit cards! Until you do this, the rest won't work. Once you stop using them, you can either try reducing your own debt by using low interest credit cards and balance transfers, or setting up your own plan using the snowball method (paying as much as possible towards the debt with the smallest balance then once that's paid off adding that amount to the next one, and so on). 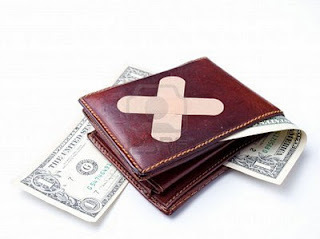 If you can't do it yourself, contact a debt relief or credit counseling company. Make sure to check out the company's Better Business Bureau report and reading the agreement carefully BEFORE you sign up. The easiest way to do that is to pay on time and keep your debt down. But you should also check your credit report periodically to make sure it is accurate, and you don't have any "mystery" accounts on there that you didn't open. You can get a free copy, with no strings attached, at annualcreditreport.com - forget the free credit reports you see on TV, those all require that you sign up for a monthly service. I know, nobody wants to spend any more money than necessary on insurance. But it is an important part of any financial plan. If you own a home, homeowners insurance is a must (and if you have a mortgage it is required). But even if you rent, it is worthwhile to have, to protect your belongings in case of disaster. And it really isn't that expensive. And if you are the primary breadwinner, life insurance is a good idea too, so that if anything happens to you, your family will be able to survive financially. So call your local agent and discuss your options. For some people, this is the hardest one of all. Unless you are rich, or at least very comfortable, then money can cause lots of stress. And it is very easy to get caught up in the stress, or the need to work extra jobs, and forget about the good things in life. At the very least, take some time to relax, do fun things even if it just means going out for ice cream and a movie once a month. Just make sure to do something fun on a regular basis so you don't spend all your time focusing on money! I know, this isn't easy. And you may not be able to do all 6 at the same time. But if you work at it, you can build a nice financial life for yourself and your family.